Hello, and thanks for visiting me today. So this week has passed by relatively quietly which has been nice, and I'm looking forward to a relaxing weekend. Hope that whatever you got planned for the weekend involves keeping warm and snug! I have a backlog of photos in my dropbox of cards that I'd made before Christmas so I decided to share one today, have used the same image as the card on my previous post, but when its as sweet as this - that's ok! The image is from the LOTV girls sketchpad, and I have coloured her with promarkers. Having cut out image using go kreate dies I mounted into a gorgeous doily. The paper is from Papermania stack, the flowers were made using a very old woodware punch, and I've added a bit of faux stitching with white gelly pen. The ribbon and pearls are from stash and sentiment is my own work. I also have exciting news to share..............back in December I entered a DT call with Creatalicious Challenges, and was delighted and excited when Melanie emailed me to offer me a spot. Due to the events of the last few weeks, I've not taken part in January's challenge, but I will be there next month - very much looking forward to working with this lovely team, and being a teamie for a change instead of the boss lady! 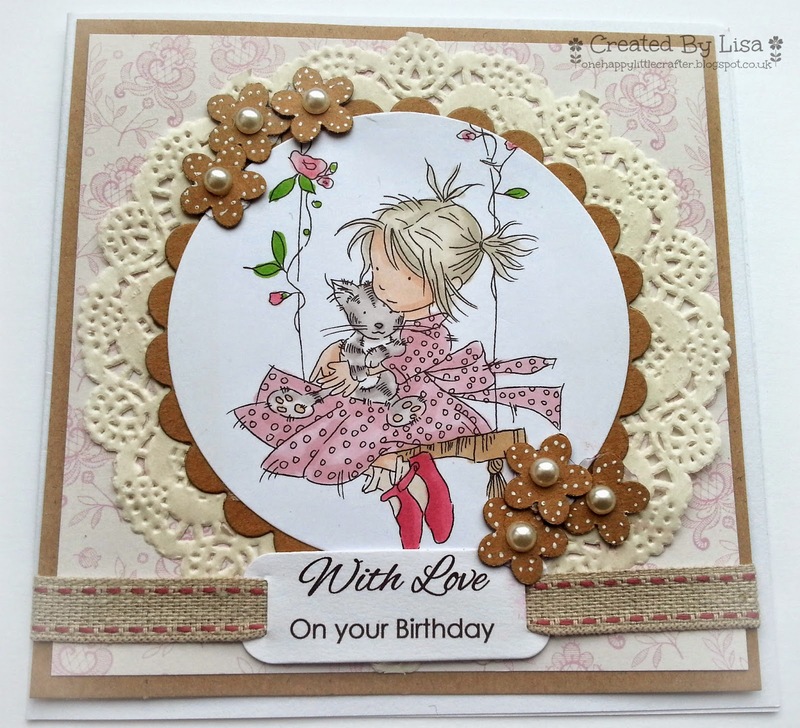 Your card is so beautiful Lisa, I love the sweet image, gorgeous colours and pretty detailing. Congrats on your new DT place too, I am really pleased for you. Such a pretty card and Congratulations on your DT post. Hi Lisa love the card gorgeous!! Wonderful card and I love the doily and the little flowers. Great image and fun card. thanks for joining us at Aud Sentiments for our ATG challenge. Such a sweet, pretty card! What a darling design Lisa and love all the details. This is such a pretty card Lisa, your image is lovely and your design perfect. What a sweet card. Thanks for joining us at Aud Sentiments. We are having a DT call and you still have time to enter. Hi Lisa~~Welcome to The Creatalicious Team!!! So happy to create beside you:) Your blog and card are adorable! !